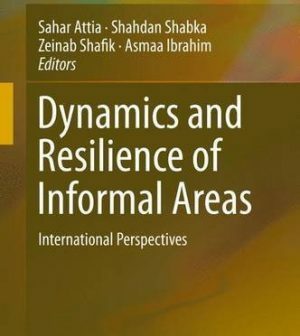 This volume provides visionary approaches within the multi-disciplines engaged with informal settlements covering three main themes; ‘Innovative Policies and Strategies to Informal Urbanism’; ‘Production, Operation and the Life-World of Urban Space’ and finally ‘The Dynamics of Informal Settlements’. The book reflects multi-disciplinary experiences dealing with informality, where authors from a number of global regions present cases, practices and ideologies related to their respective context. This is elaborated through fifteen selected papers, most of which, were presented at the International conference: ARCHCAIRO 6 (the 6th International Conference), “RESPONSIVE URBANISM IN INFORMAL AREAS TOWARDS A REGIONAL AGENDA FOR HABITAT III”. The conference was organized as a collaborative activity within the “Informal Urbanism Hub” of the HABITAT University Network Initiative (UNI), the Regional Office for Arab Countries, and Cairo University, aiming at reducing the gap between academia and practice. Urbanization, Collective Action and Coping Strategies in Informal Areas of African Cities: A Polycentric Environmental Planning Perspective, Akinola, Samson R.
Right to Urban Space in Post-Revolution Cairo: A Study for Street Vending Phenomenon, Kafafy, Nezar A.